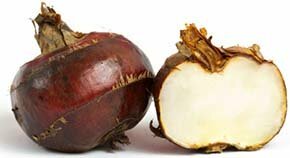 Water chestnuts are nutritious tubers (corms) grown for their mildly sweet, delicious, coconut-like crunchy textured edible pulp. The corms are cultivated in the wet-fields and used as vegetables in many parts of Asia, particularly in China, Japan, South korea and Vietnam. Botanically, waterchestnut belongs to the Cyperaceae (sedge) family of grass-like aquatic plants; in the genus: Eleocharis. The corms, known as haeo (แห้ว) in Thai, and biqi (荸荠) or matai (马蹄)in the cantonese are quite popular for thier nutty, crispy texture in the dishes. Water chestnut tubers are native to the marshy, still or slow moving water plains (wetlands) of South-East Asia. Waterchestnut plant bears numerous, round, corms below the ground, which are ready for harvesting when its leaves turn yellow. The bulbs feature a coarse dark brown skin, measure about 5 cm in diameter and weigh 30 g. Inside, its crispy, white-fleshed flesh is mildly sweet and has pleasant aroma. Chinese waterchestnuts should not be confused to European water caltrops (T. natans) which also recognised as western waterchestnuts in the markets. Water chestnuts carry slightly more calories than sweet potatoes at 97 calories per 100 grams. Their calorie value chiefly comes from complex carbohydrates, amylose, and amylopectin. They carry high-quality phytonutrient profile comprising of dietary fiber, and antioxidants in addition to moderate proportions of minerals, and vitamins. Crunchy water chestnut corms are good source dietary fiber. 100 g flesh provides 3 g or 8% of daily requirement of dietary fiber. Together with slow digesting complex carbohydrates, fibers in the food check sudden spurt in the blood sugar levels. The corms are indeed natural sources of phenolic antioxidant; ferulic acid. In addition to free radical scavanging function, ferulic acid possesses blood pressure controlling, anti-diabetic, photo-protection against UV rays, and anti-cancer properties. It also contains good levels of some of the valuable B-complex group of vitamins such as pyridoxine (25% of RDA), folates, riboflavin (15%), pantothenic acid (9.5%), and thiamin. Further, the corms provide healthy amounts of some of the essential minerals like zinc, magnesium, copper (36% of RDA), manganese, phosporous and manganese. they also carry moderate amounts of potassium; 330 mg/100 g (7% of RDA). Potassium is an essential component of cell and body fluids that help regulate heart rate and blood pressure. raw leaves, Nutrition value per 100 g.
In its growing places, Chinese waterchestnuts can be available at their best from the onset of summer season to fall. In the US, they are sold primarily in the Asian specialty stores or as canned in the supermarkets. Choose that are fresh and very hard. Avoid bruised or ones that have soft spots. Water chestnuts are fairly fragile, so it is best to store them unpeeled. They keep well in the fridge for 2 weeks, in a container and covered with water. Fresh, unwashed water chestnuts can be also placed for 2 weeks in a paper bag and stored in the coldest part of the fridge. They need to be checked regularly, as they can start to dry out or ferment. Peeled water chestnuts keep for 2-3 days. Refrigerate any uneaten canned water chestnuts in water, replacing with fresh water every day. Wholesale marketers store them in the freezer for up to 6 months, raw and plunged. Cooking makes water chestnuts slightly sweeter and preserves their crunchy texture. Only water chestnuts of E. dulcis species can be eaten raw. Peeled corms can be used boiled, braised, in stir-fries, etc. Peeled chestnuts can be used as whole, halved, sliced diced julienned or pureed. They add a characteristic crunchy note to many dishes. In the mainland China, pureed watechestnut used in dim sum preparation. Sliced/diced, they can be added in soups, mixed salads, fruit salads, vegetable-based dishes, pasta dishes and quiches, meat, poultry, and seafood. Waterchestnut cake (matai gau) is a delicious recipe prepared during Chinese New Year (autumn) festival in the Southern-China, and Hong Kong. Water chestnut puree can be added to chicken stock with onions, apples and a light cream, or to potato, sweet potato or pumpkin. Being water-dwelling crops, water chestnuts may harbor fluke larvae (Fasciolopsis). Fresh chestnuts should be washed thoroughly in running water, soaked in salt water for at least 30 minutes and rewashed again before eating them raw. Boiling kills the larvae instantly and any cooked recipes are safe for consumption. (Medical disclaimer). <<-Back to Vegetables from Chinese water chestnuts. Visit here for an impressive list of vegetables with complete illustrations of their nutrition facts and health benefits. Published-Apr 04, 2019, © copyright 2009-19 @ Umesh Rudrappa. All rights reserved.